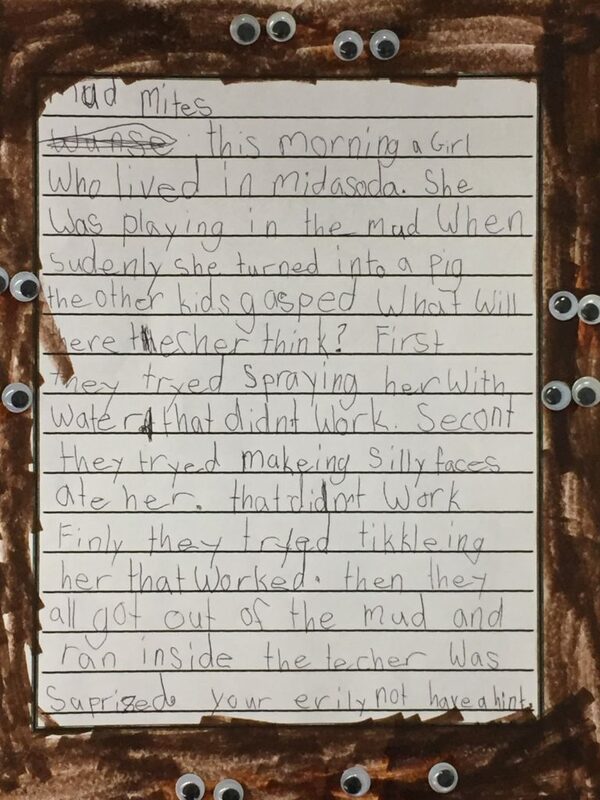 The mud mites art accent makes this a winner lesson. When the students see the tiny googly eyes that they get to glue around their border, they get excited to write. The mud mites accent is an easy TWO steps. Color the border with brown marker. 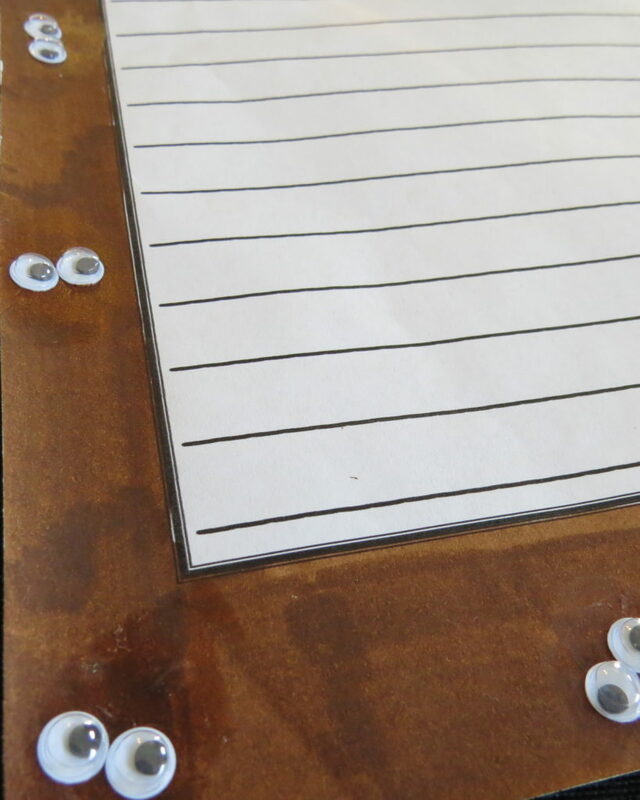 Use a glue stick to glue 5-10 pairs of tiny googly eyes*. You can find tiny or small googly eyes in the craft aisle of Walmart. If you have a small group of students, by all means allow them more googly eyes. 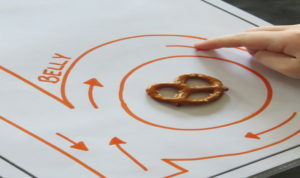 Remember, the simple art accents motivate them to write and reward them for their work! The eyes stick best if you put the glue on the PAPER. Then, simply place the eyes onto the spot of glue. 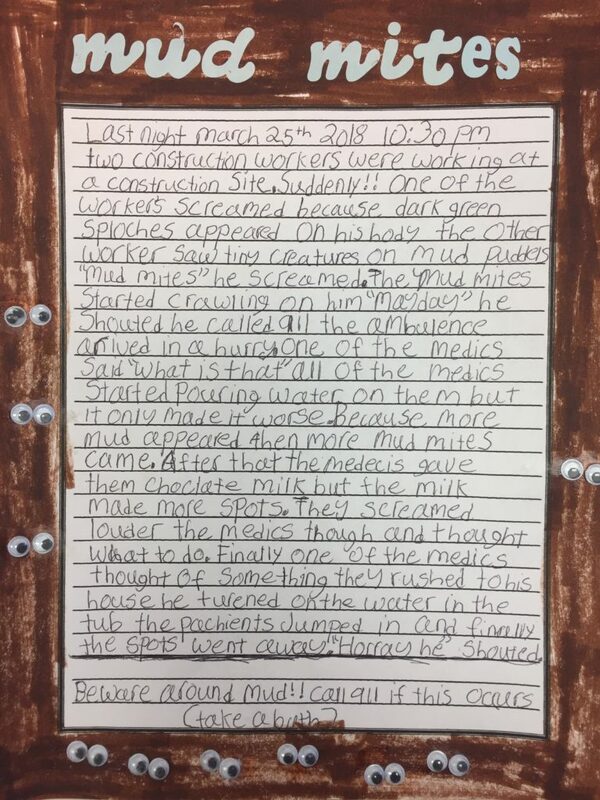 I first thought of the mud mites art accent, THEN, created the writing prompt. I don’t know if they actually exist….I casually did some research and different things came up. The reality of mud mites wasn’t my focus here. I wanted children to have fun imagining mud mites and create an outbreak. Now for the writing lesson! Brainstorm possible cures for the reactions: Spraying fruit punch, bathing in lime juice, wearing a suit for 24 hours etc. 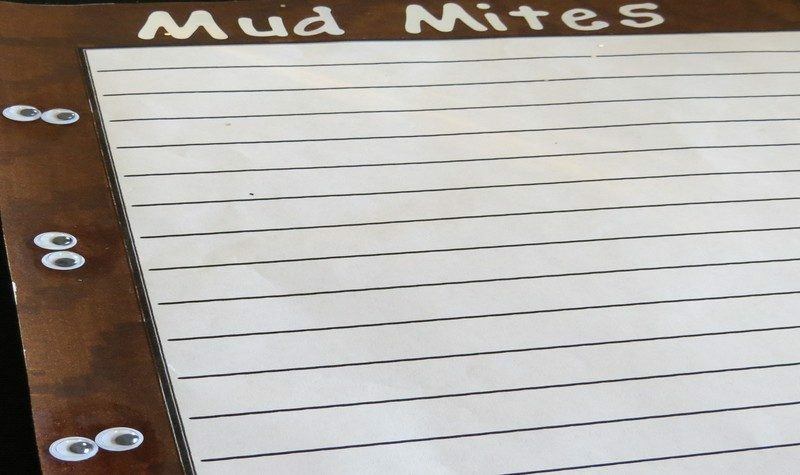 Brainstorm possible ways to get rid of the mud mites themselves: flooding the area with Dr. Pepper, drying the area with hot lamps, mixing vinegar into the mud etc. Have fun gathering your students’ ideas! The attempts can be to cure the reaction, get rid of the mud mites or both. News Flash! Breaking News! Mud Mites Mess in North Dakota! 2. Write when and where the outbreak occurred. 3. Write what happened and to whom. 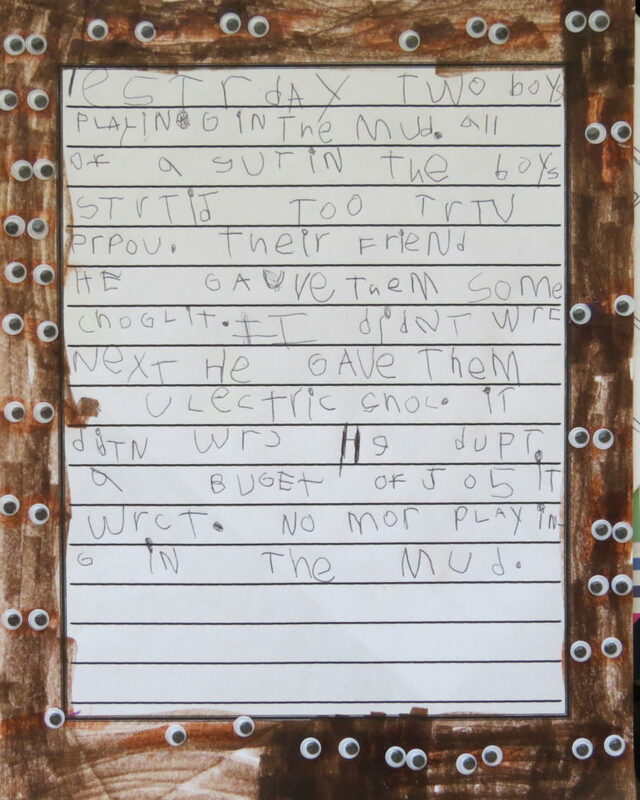 Two children were playing in the mud when suddenly they had purple spots all over their arms and legs. 4. Write the first attempt to help them. Their mom sprayed them with the hose. Nothing happened. 5. Write the second attempt to help them. Paramedics came and rubbed chocolate all over the spots. That didn’t work. 6. Write the third attempt to help them. Two friends gave them a spoonful of lemon juice. That worked! The spots went away. 7. Write a conclusion. Advise or warn the reader in some way. Scientists are looking into what caused the breakout. For now, stay out of the mud or have lemon juice close by! 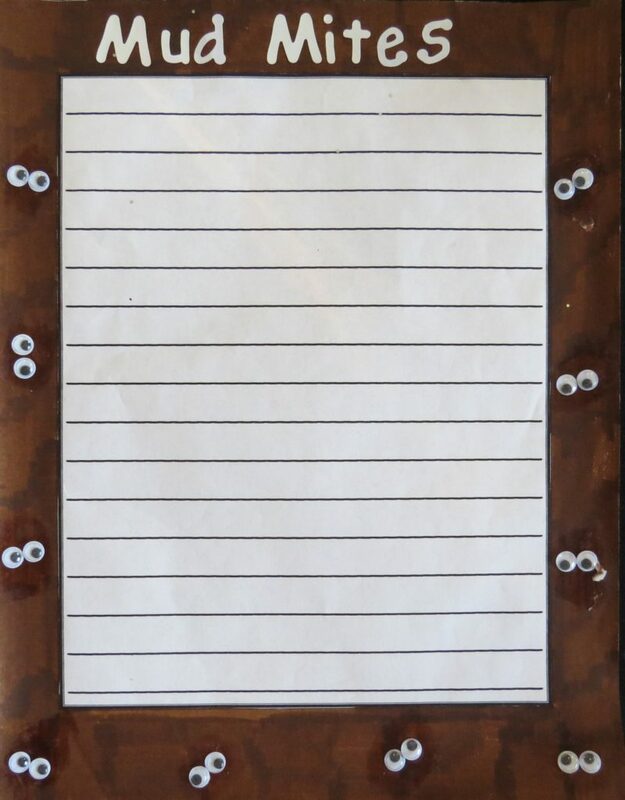 As soon as the students are finished writing they can complete their mud mites art accent by coloring the border brown, putting glue on the brown border and pressing pairs of googly eyes around the border. 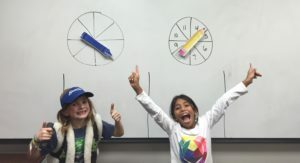 Students can write a title with marker or ABC stickers*.